can show you how to create lasting wealth? Imagine becoming an apprentice to the richest and wisest man who ever lived, a man whose wealth was hundreds of times greater than that of Donald Trump. In fact, his wealth was greater than the worth of Microsoft and WalMart combined! And then there is his wisdom: greater than that of any man who ever lived before him or after him. Imagine a man with more wisdom than Warren Buffett, Sam Walton, and Bill Gates combined. Is it any wonder that some of the most successful people who ever lived were those whose parents taught them daily from this rich and wise man's writings... men like Abraham Lincoln, Thomas Edison, and Henry Ford to name a few. And the man who penned these words was King Solomon. That's right, the undisputed richest and wisest man the world has ever known, based on the value of money over time. The only problem is that today it's very hard to understand the true meaning of many of his writings without a thorough knowledge of their context and an understanding of the life and times of King Solomon. And that's where multimillionaire entrepreneur and author Steve Scott brings in his 30 years of study and application of his writings to his personal and professional life. Steve unlocks the hidden meanings and dynamic power of each of the strategies, insights, and directives found in the teachings of King Solomon. His translation is the focus of his audio series Lessons from the Richest Man Who Ever Lived: His Incomparable Insights and Breakthrough Strategies for Success, Happiness, and Wealth. When Steve first told me of his desire to create this series, I thought he was talking about a religious audio series. He quickly corrected me, saying, "This series is NOT about religion; it's about getting the absolute MOST out of every aspect of life." And then he said something I'll never forget. "Vic, no one in my life has ever presented me with a single question or problem that wasn't answered and solved through King Solomon’s teachings. There is nothing in one's life — personal, professional, or financial — that isn't dealt with in an amazing way by this wise and wealthy man. He went on to say that Solomon not only answers every question and solves every problem, he also provides specific insights and strategies that can empower anyone to achieve levels of success, happiness, fulfillment, and security that are far greater than they could ever imagine. As Steve Scott has found out for himself, Solomon's wisdom has as much transformative power today as it did thousands of years ago. When Steve has used Solomon's strategies in his choices and decisions, he's had tremendous success and happiness in any area he's applied them to — whether in business or in his personal relationships. And when he's ignored or walked away from the admonitions and the warnings that Solomon gives us throughout the sessions in Lessons from the Richest Man Who Ever Lived, he's experienced devastating consequences — financially, in business, and in his personal life. But when he returned to the wisdom of Solomon's strategies, he regained all that he had lost. Steve has never before revealed the enormous role Solomon's time-tested wisdom played in creating his fortunes... until now. In this program, Steve becomes your mentor. He'll reveal the most powerful and relevant strategies of King Solomon. He'll shed new light on the hidden secrets of Solomon's success. And he'll help you develop the skills and techniques that enable you to harness the power of Solomon's teachings and incorporate them into your business and personal pursuits. Steve will also reveal the devastating traps that Solomon warns all of us to avoid. These traps are like robbers that steal away the success, wealth, happiness, and financial security each of us could have. Regardless of your spiritual or religious persuasion (or lack of it), you'll be amazed at the precision and clarity of Solomon's instructions. And when you implement this timeless wisdom in your life, you'll be astounded at how quickly the changes happen. Respond within the next 10 days, and I'll send you your FREE bonus audio session, "The Key That Opens Every Door." Many adults are stuck on a raft, going downstream to wherever the river takes them. They feel powerless to change their lives. So they remain stuck in relationships, jobs, careers, and personal circumstances they don't enjoy. Most of us are on that same raft. We continue to go with the flow. But at the end of our year we say, "Gee, where did the year go? I didn't achieve any of the things I wanted to." It's time to get off that raft and out of the river. It's time to travel toward the treasures Solomon promises you. It's time to steer your life in the right direction — with your marriage, parenting, job, and career. Experience a richness of life unlike anything you've had before. Order Lessons from the Richest Man Who Ever Lived TODAY! P.S. Many adults are stuck on a raft, going downstream to wherever the river takes them. They feel powerless to change their lives. So they remain stuck in relationships, jobs, careers, and personal circumstances they don't enjoy. Most of us are on that same raft. We continue to go with the flow. But at the end of our year we say, "Gee, where did the year go? I didn't achieve any of the things I wanted to." It doesn't have to be this way. It's time to get off that raft and out of the river. It's time to travel toward the treasures Solomon promises you. It's time to steer your life in the right direction — with your marriage, parenting, job, and career. Experience a richness of life unlike anything you've had before. Order Lessons from the Richest Man Who Ever Lived TODAY! I want to enhance my relationships, increase my wealth, and apply the insights and strategies of the richest and wisest man who ever lived to my own life! 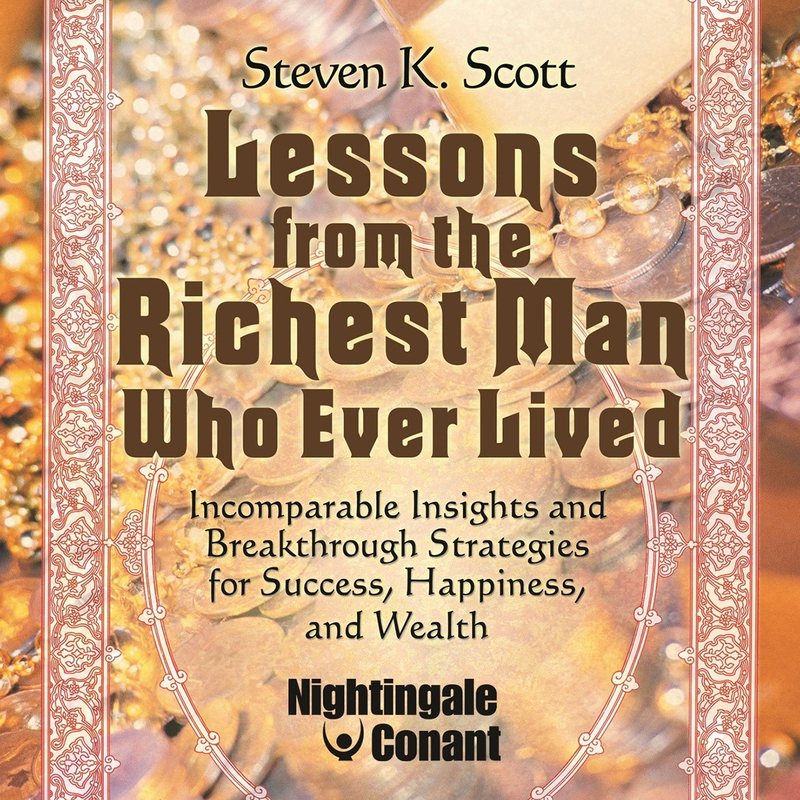 Please send me Steven K. Scott's audio program Lessons from the Richest Man Who Ever Lived, at the special price below. - I can select one of two ways of ordering.